Reliance Jio and State Bank of India have come out of the curtains announcing their latest step to deepen the partnership between the two entities. Reliance Jio and SBI are going to collaborate on many fronts to deepen their digital partnership. Notably, the primary product which will benefit from this collaboration is Jio Payments Bank which is a Joint Venture between Reliance Jio and SBI. The SBI YONO app and Reliance Jio’s MyJio app will seamlessly integrate the best of what both companies have to offer, Reliance Jio hinted. 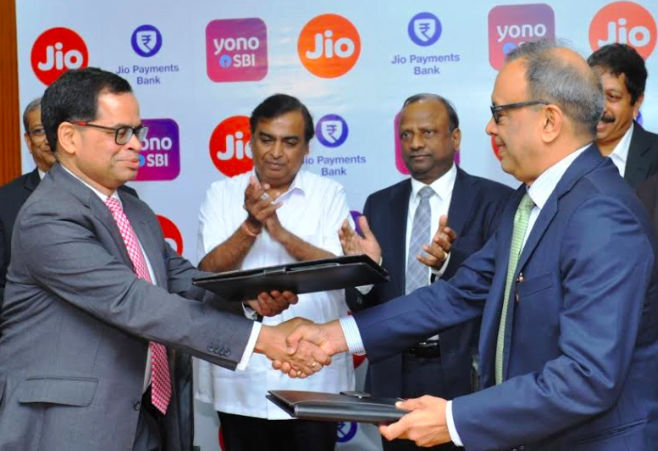 The company also highlighted that Reliance Jio would enable YONO’s digital payments and banking features and similarly Jio will bring the digital payment capabilities of SBI to Jio Payments Bank. The Mukesh Ambani led telco also announced that the effect of this partnership would mean an enhanced consumer experience since now the customers will get both the added benefits of SBI Rewardz (existing loyalty program from SBI) and Jio Prime. Users will be able to redeem their loyalty points from SBI and also Reliance Jio will its offer its products at a special discount for SBI customers. SBI will also join Reliance Jio as its preferred partner for designing and providing network and connectivity solutions. Jio’s high speed and reliance internet connectivity present in the urban regions will enable the bank to deploy customer-centric services such as video banking and others. Since a large majority of Indians in tier 2/3/4 have an SBI account, the usage of SBI rewards points on Jio means Jio will become no.1 in terms of customer market share in a few years. Other telcos should now start partnering up with known banks…..